BroadedNet has been around since September 2014 principally for WordPress users. My first attempt at getting it work for blogger and other CMS platforms failed. So if your blog is running on Blogger/Blogspot, your may want to go try this out so you can be part of the growing community. NB: Since the blogger API is loaded asynchronously (only after your site has finished loading), it will not slow down your site. Is BroadedNet Search Engine Friendly? Is my Adsense Account save? As a matter of fact, installing BroadedNet on your blogger/Blogspot blog is very easy. First, create a free account on BroadedNet. If you are already a member, simply sign in. While in your account, click Integrate. Then follow instructions on the form to generate the html script. There are 3 different types of content to show on the widget on your blog. The first and most commonly used is the Random Article Titles. If you select this option, BroadedNet will randomly pick articles from the platform and show on the widget on your blog. This of course will be within the chosen category. The Third widget type is banners. There are banners of different sizes so be sure to select the most perfect fit for the chosen position on your blog. If in option 1 above you selected to show content from custom widget, pick the custom widget from the list in point 2. Discard this option if you did not select custom widget. This is as simple as it sounds. You must select a category that closely relate to your niche. Don’t be a weight loss blogger who wants to promote dog training articles on the BroadedNet widget. Set the size of the gravatar according to your design need. The maximum is 80 and minimum is 30. Activate this option to show some love. This will add a “powered by Broaded” link below the widget on your blog. Here are free credits to start your Blogger/BlogSpot journey. WordPress bloggers can also benefit from this offer. Just share this blog post below and unlock the coupon code! Let me know how your experience has been with BroadedNet so far. Is this your first time? Drop a comment in the comment box below. It means you brought your amazing traffic generating tools for blogspot platform. Ahh! I think it’s a blessing for the people who use blogspot. At last thanks for your free credit. I really enjoy your free credits 🙂 . Cheers! This is awesome you have given an opportunity to bloggers blog users also to drive traffic via Broaded there are many friends who are using blogger I had suggested them to use it. I know they will get benefited by these for sure. Hello Enstine, I have been following your blog for some time now. And i must confess that you are really a pro blogger helping newbie bloggers to grow in one way or the other. Your newly introduced brodedNET API for Blogger/bogspot will help bloggers using blogspot platform. Have noticed broadednet in blogengage too. I guess I’m gonna need to give a try once. I think there was some offer running a while ago. thanks for introducing this facility for bloggers..
i have integrated on my blog..
Great news for blogger. This widget was expected for a long time and it is good news for blogger users. It looks like you found good programmer to create the broadednet API for blogger platform. Wow that’s great. So, broaded has more users now that means broaded users will be able to get more traffic. Yeah the more the users, the more traffic we stand to get. Thanks enstine for the the coupon. I got 350 credits!!! Will check it how it goes with by new blog. i have been following your blog for quite some time and i am learning a lot from here. Can you suggest me any monetizing method other than adsense? I know bloggers can earn much from affiliate marketing but i think i am not good at it right now. What do you think about sponsored review or post? is there any marketplace to sell sponsored review? Hi Enstine, its really a great news for Blogger users like me,i was waiting for this great news,i will use BroadedNet API for drawing quality traffic. Hi Enstine, am really happy this is now finally available for Blogspot users I just implemented it and its working fine and thanks for the Coupon you shared. Now blogger user can use broaded.net as a new traffic source. Going to add broaded.net widget one of my blogspot blogs. Thanks for this coupon code. It’s very good news to you and the Blogger community. It will also help you to expand your business into a new community and get more benefits. This is awesome news Enstine! I have a lot of friends that use Blogger and have already passed this along. I hope they heed my advice and join up! Thank you for making this available to them! Cool 8) I have recently added more content to my Blogger blog and this makes a nice option for adding engagement along with CommentLuv populating my posts as well. Very useful, Just now im integrated it on My blog with the help of your Guide Thanks Man For Your Useful And helpful Posts. This is a great option for those who use Blogger. Most of the new bloggers are on Blogger, so you should be getting a lot of new registrations. One of the reasons new bloggers use Blogger is because it’s very easy to use. The API looks very easy to setup. Broaded.net should do very well with this latest addition. There’s been a lot of engagement since adding this option a few hours ago. In my last comment I asked about the the blogger widget and wow you made it for it . 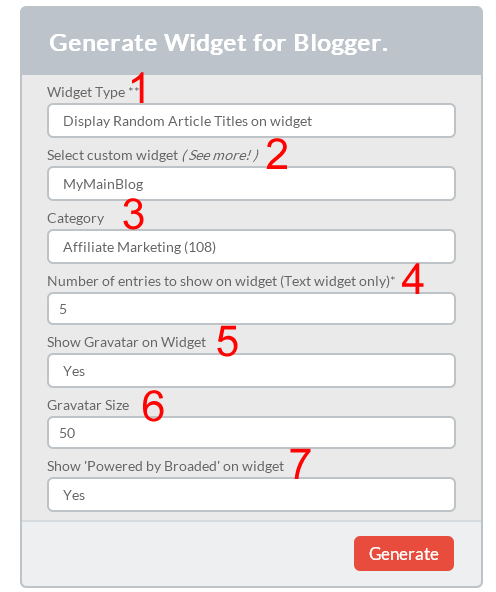 This is a great news of the blogger widget for broaded.com . Thanks for launching this blogger widget , it will be of great use for blogger users as it will also help a lot in getting free traffic for my blog . Also thanks for the free credit you gave , it will help to get free credit . Also thanks for sharing this post . tried it out, it’s really great. finally, i don’t need to depend much on social media for traffic. What a pleasant thing to be here again! What a lovely plugin you made for blogspot users! I raised my curiosity on this plugin for the blogspot users! And Now I am so glad that you created one for them too! I just embedded this in all my blogspot page just now. Thanks Enstine for this wonderful and amazing plugin. What an average thing to be here once more! What a stunning plugin you made for blogspot clients! I raised my interest on this plugin for the blogspot clients! What’s more Now I am glad to the point that you made one for them as well! I simply implanted this in all my blogspot page seconds ago. Expresses gratitude toward Enstine for this radiant and astounding plugin. Might you have an extraordinary weekend. It’s a wonderful gift for the blogspot users. I just landed on your blog and saw this wonderful resource for generating some good amount of traffic. Would you recommend using WordPress or blogger as a platform? We’re currently starting off on WordPress but could move over. I assume this is based on website type? Either way this looks useful! either of them is good to go with but the API is specifically fir blogger. There is a WP widget you can simply install and configure. Firstly, congos for increasing the reach the reach of BroadedNet to Blogger and Blogspot websites. Thanks for bringing in this awesome tool for other blogging mediums. Currently, I have been using an WordPress blog and have been thinking of making a micro-niche blog, will surely use it over there. P.S: Thanks for free credits! I have never heard of BroadedNet before but it looks great. So customizable and flexible. Love it! I see in the comments that there is a wordpress plugin also. I will definitely look into this further! Thanks for sharing. Definitely thrilled to have broaded. web inside my weblog, It helps me within generating good quality targeted traffic from popular weblog, I was hanging around scince january due to this element and then We have it inside my weblog. Many thanks for your work brother. now, I have been following your blog for some time. cause your blog is useful for me. and really excited to have broaded.net in my site, it will help me in driving good traffic from popular blog.